FIFTH century BC Greek artist Zeuxis painted grapes so realistically that birds came to peck at them. Twenty-first century artist Conor Walton's paintings of grapes, a slab of butter, a cake, brack, bars of chocolate, biscuits, are so realistically and brilliantly done that you could eat them. You'd want to. Walton, who studied in Florence and enjoys an international reputation, is steeped in the classical tradition, has perfected the grand style but he is also a thoroughly modern artist; the work is informed by a contemporary intellectual sensibility. This painting combines the old and new. 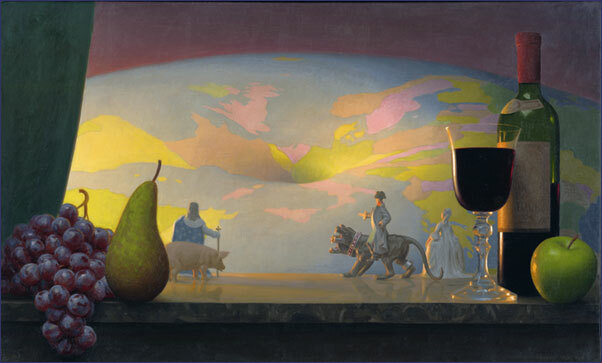 The grapes, pear, apple, wine glass, bottle, all belong to the rich still life tradition. The curtain, marble shelf and Walton's arced deep pink background become a stage complete with proscenium arch. But the title, Black Hole, tells us this is a bang-up-to-the-minute, big bang painting. There is a playful energy, a fascinating contrast,between then and now and this is especially captured in the plastic figures, which Walton bought for his three small children in the gift shop at the Louvre. Walton has placed Louis XVI, Le Roi Soleil himself, his wife Marie Antoinette and Napoleon in the background. These royal and powerful figures were once on the world stage. The royals are facing away and gaze upon the world map. The sow adds a down-to-earth touch. Napoleon, usually astride a horse rides mythological Cerberus, the monstrous, three-headed dog that guards the gates of Hades. This was Walton's son's doing – playing with the figures he mixed them up and it resulted in "a beast upon a beast". Are these figures from history looking to the future? What they and we see is an image that contains both a beautiful stillness and a sense of impending chaos. The concave globe, in beautiful pastel colours, is about to go down the tubes – Germany goes first – and Heisenberg's Uncertainty Principle and Black Holes come to mind. But the most striking thing of all about Walton, who is only in his forties, is his command of light. This image of an imploding, transient world is suffused with a golden glow.